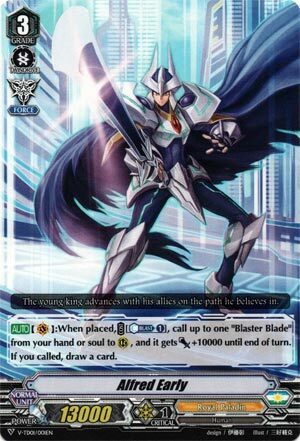 [AUTO](VC):When placed, COST [Counter Blast (1)], call up to one “Blaster Blade” from your hand or soul to (RC), and it gets [Power]+10000 until end of turn. If you called, draw a card. Basically a placeholder until we get King of Knights Alfred in the upcoming booster. Even then, don’t cry if you don’t like the thought of the lost money because all you really want is the Force Gift and enough Soul to make Soul Saver Dragon work. Oh, but of course, in Premium Format right now this is enjoying so many benefits. Tarna abuse to generate gifts aplenty, 13k base to get around Dominate to a point, meater triggers for guarding, and the name is gold for Blaster and Alfred support. It’s a +2 if you ride Blaster Blade and it’s meaty. Not much to say otherwise.